Missionary Donna Chatt Pewo is praying that United Methodist “repentance” for past injustice to Native Americans and other indigenous people will open new doors for her ministry among Arapaho and Cheyenne children in western Oklahoma. “It’s a start,” she said in an interview in Tampa where, on the night of April 27, The United Methodist Church officially asked God’s forgiveness for all manner of past violence and neglect of native people. The value of the action was also welcomed by Gary Locklear, another missionary who is a member of the Lumbee Tribe in North Carolina and a delegate to General Conference 2012. The service was prompted in part by the 1864 massacre of 168 unarmed Cheyenne and Arapaho near Sand Creek, Colo. Sand Creek stands as a symbol of a violent past to Methodists because John Chivington, who led the raid, was an ordained Methodist pastor and local army officer. His superior who approved the raid was also Methodist. “An Act of Repentance Toward Healing Relationships with Indigenous People” was one of the high moments of the 2012 General Conference, an event held every four years to conduct church business. Pewo, a member of the Choctaw Nation who works in Clinton and El Reno, Okla., said that Sand Creek casts a long shadow, still causing Cheyenne and Arapaho to be cautious about contact with Methodists. “The wounds are still open and the people feel that the church has neglected them,” she said. “The Act of Repentance gives us a chance to show the love of Jesus Christ.” She is hopeful that the denomination will take steps to ensure that news of the action reaches Indian Country. Pewo, a local pastor, was in Tampa to be commissioned as a Church and Community Worker, a category of missionary service, by the denomination’s mission agency, the United Methodist Board of Global Ministries. George Tinker, who teaches at United Methodist-related Iliff School of Theology in Denver, gave the sermon for the service of repentance. A member of the Osage Nation and a Lutheran clergyman, Tinker said he deeply respected the United Methodists for starting the process of repentance, which he said is complex and dangerous. Locklear, the missionary in North Carolina, said he was excited by the possibilities opened by the Act of Repentance. Locklear, a Church and Community Worker and Home Missioner, organized a group of some 30 Lumbees to attend the Act of Repentance. The service is seen as the launch of an ongoing process of repentance and contribution for the abuse of native peoples worldwide; it also promotes a spirit of healing. Josephine Deere, a member of the Muscogee Nation, Global Ministries’ director and General Conference delegate from the Oklahoma Indian Missionary Conference, said many Native Americans are wondering whether United Methodists will follow through with the Act of Repentance. The Tampa event was the third act of repentance of the church, said the Rev. Stephen Sidorak, top staff executive of the United Methodist Commission on Christian Unity and Interreligious Concerns, which planned the service of repentance. The previous occasions, at the General Conferences of 2000 and 2004, related to Methodist treatment of African Americans. The Rev. 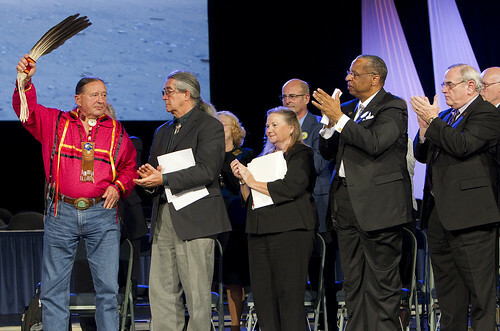 George Tinker (left) receives the applause of United Methodist Church leaders after giving the sermon during an "Act of Repentance Toward Healing Relationships with Indigenous Peoples" at the 2012 United Methodist General Conference. Applauding Tinker (from left, front row) are: the Rev. Thom White Wolf Fassett and bishops Mary Ann Swenson, Robert E. Hayes Jr. and Larry M. Goodpaster. A UMNS photo by Mike DuBose. What happened at Sand Creek has for decades haunted American Methodism. Chivington was never disciplined or even chastised by the church. The 1996 General Conference in Denver expressed its regret and issued an apology for Chivington’s actions. It also passed a resolution supporting U.S. government restitutions to the Cheyenne and Arapaho tribes. These actions were considered tepid and insignificant by Native American United Methodists. In 2008, the General Conference voted to contribute $50,000 to the National Park Service toward building the Sand Creek Massacre National Historic Site Research and Learning Center, near the massacre site in Colorado. Sand Creek was only one incident in what Tinker called “500 years of Christian conquest” in the Americas, involving the displacement and slaughter of native peoples. The 2008 General Conference also authorized the Commission on Christian Unity and Interreligious Concerns to prepare resources to promote healing between the church and indigenous people and to plan an Act of Repentance for the 2012 General Conference. Various petitions, expected to be adopted in Tampa, call for ongoing actions toward repentance and healing. An increased awareness of Native American history and contemporary culture was visible at the Tampa conference. The geographic region has a spotty history concerning indigenous people. It was one of the areas from which Maskoke -- which are known to non-Native Americans as Muscogee (“Creek”) -- people were forced to leave to resettle in Oklahoma following the 1830 Indian Removal Act. At the opening of the conference, artist Marcus Briggs-Cloud, a Maskoke, performed a native ceremony of consecration of the space in which plenary sessions were held. Global Ministries assisted in bringing several Native Americans to Tampa for the Act of Repentance, among them Skyler Corbett, a young man of the Klamath Paute who is a member of Wilshire United Methodist Church in Portland, Ore. In an interview, Corbett recalled how he was bullied and taunted when he was younger because he was Native American. He also felt he was considered “different” in the churches he attended, until he found Wilshire Church. “I joined because in an open session, the members sat in a circle, an open circle, and I told what it means to be Native American, what our history means.” He felt accepted. Pewo worked in the Clinton/El Reno area for several years before seeking missionary status. She traces her call to ministry to an experience in 1999 when she faced two possible paths, and Jesus called to her from one, saying, “Follow me.” She was guided, she says, to “bring God’s gospel of love, mercy, and justice” to the children in the communities of the Cheyenne and Arapaho. Pewo is especially hopeful that the church can bring a message of love and concern to children and youth. She works at the Clinton Indian Community Center with 35 youngsters ages 3 to 14. “Many are from broken homes and experience discrimination in public school,” she says. “The church is their place of refuge. They have taken ownership of the church, not only looking after our building but also looking out for one another. *Wright is a long-time reporter on United Methodist news. Christie R. House, editor of New World Outlook magazine, contributed to this article.